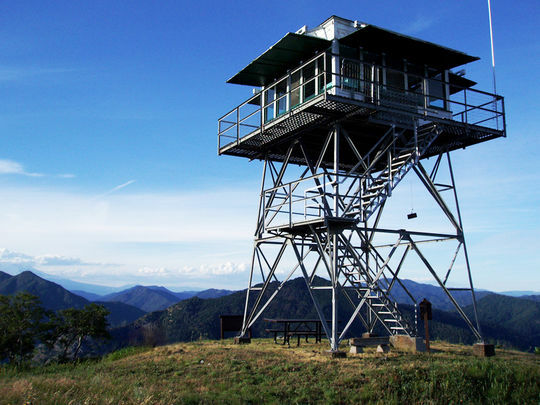 Fire lookout rentals in the great California Wildernesses. I didn't realize fire lookouts were available in California for general public use. Surely, these are all staffed by rangers, right? Wrong. Not only are fire lookouts available, you can book one as simply as booking an Airbnb rental. Since childhood, I've wanted to sleep in a fire lookout. Think about the views. Not just the landscape itself, but imagine unblighted views of the Milky Way at night. There are few unmarred or light pollution free places left in California to get a penetrating view of the cosmos. Imagine the next getaway being hoisted into the sky. An easily bookable adventure. Prices vary between on-or-off season and availability. Some lookouts are available for $35, others upwards of $75 a night. It depends when you decide to take the trip. Additionally, some of the lookouts are stilted in the sky, some are located on the ground in a traditional cabin arrangement. Obviously, if I'm hoofing it to the top of one of these, I'm taking the sky cabin. Pit toilets, of course, and the typical bare accommodations you'd find at just about any remote, but established campground: food vaults, picnic tables, grills, etc. All lookouts are located in Mid-to-Northern California and operate seasonally, most from late Spring to early Fall. Those listed above are the lookouts available for general public rental. However, if you plan on taking a sabbatical, or taking on the great American novel, or an exciting bullet-point on your resume, there are other lookouts available for volunteers who wish to support the "fire detection, education, interpretation and historical preservation network" of lookouts. First you need to reach out and register with the Buck Rock Foundation, an organisation designated for volunteer fire lookout staffing. You can find other lookout information and lookout jobs here. Plot your escape. ← Free Camping in California - The Best Sites Where You Probably Won't Die.